After an enjoyable, but exhausting, week in Japan I was ready to head back to Stittsville for a good rest. Unfortunately my traveling companion had other plans. We had been home for less than a day, when we were back on an airplane. This time we were headed for Las Vegas, and I didn’t know what to expect. Since leaving Geneva, I have often thought about new places I would like to visit. Sometimes I have gone on the Internet to learn more about these places, but Las Vegas was never one of the places that really interested me. Bears are really not at all interested in gambling, and I had been told that Las Vegas was a place people went to gamble. So it was not one of the places that I was particularly interested in seeing. I even told my traveling companion that I was tired, and that I would rather spend a quiet week with my grade 3 friends in Stittsville. He thought about that for a minute, and then said “no”. He said that when I left Geneva I had told him I wanted to see all the interesting places in the world. 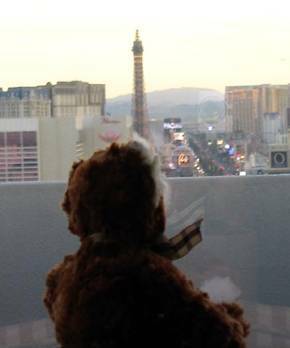 He insisted that Las Vegas was a place that everyone should see, at least once. I mentioned that Las Vegas was a bit like many places that I have read about, and wanted to visit. I saw some really amazing things – things that really did not belong in the middle of a Nevada desert. 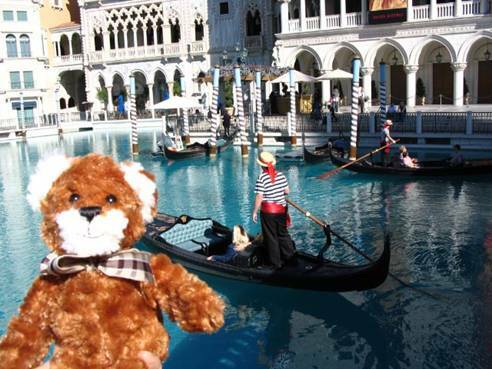 I saw the canals of Venice, with couples being taken for romantic rides on gondolas. I know what you are thinking. Venice is a long way from Las Vegas. I don’t think I would have believed it either, if I had not seen it with my own eyes. That wasn’t the only strange thing I saw. When I looked out the window of my hotel, I could see the Eiffel Tower. I know the Eiffel Tower is big, but it would have to be very, very, very big for me to see it from Las Vegas. When I was out for a walk, I even went past it, and the hotel beside it was called “Paris”. I though Paris was a city, not a hotel. It was all so strange that it made my poor little bear head hurt. I wasn’t certain that I liked having cities in the wrong place. That part of Las Vegas just seemed wrong. I am a bear who likes to travel, so I think that if you want to see a city you should travel to see it. Bringing the city to Las Vegas just isn’t the same. There were some other things that I did like though. 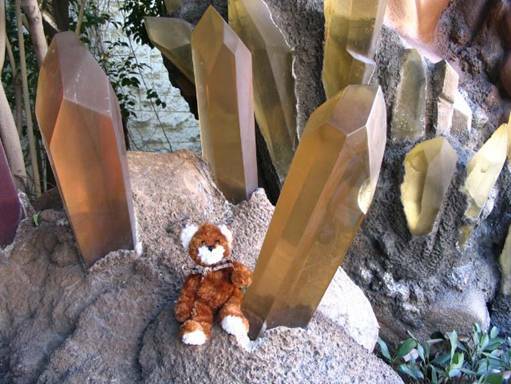 I’ve already mentioned the Lion, but I also found some amazing crystals that almost looked like they were from the movie Superman. They were so big that I couldn’t even touch the top of them. I thought about breaking one off and taking it home, but then I realized that would be wrong. Besides, people were watching, and I didn’t think they would be too happy with me if I did. It was fun to think about it just the same. Before I knew it, my week in Las Vegas was over. I didn’t really want to go there in the first place, but in the end I really enjoyed myself. It is a very strange place, but I agree with my traveling companion. It is one place that everyone should see. He said they should see it “once”, but I almost think I wouldn’t mind going back again some time. We shall see. However, all that is far in the future. For now I’m looking forward to seeing my grade 3 friends again, so I can tell them all about my latest adventure.